Remember Narain Niwas Palace Hotel’s Bar Palladio? If you don’t, I recommend you take a moment to jog your memory. Stunning, right? 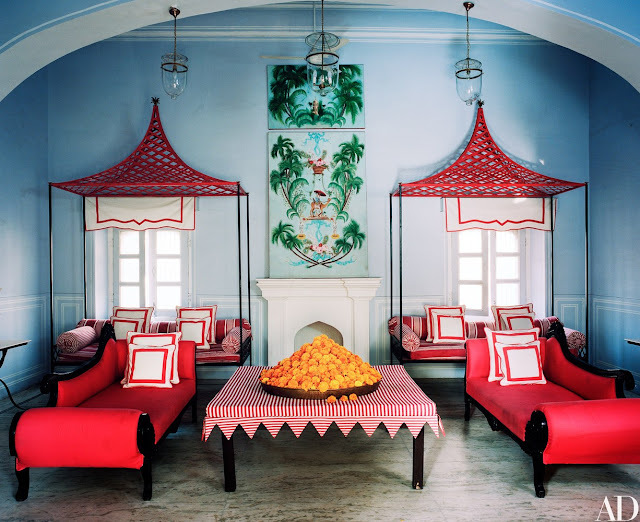 Now, thanks to Architectural Digest, we get a peek inside the mastermind’s magical residence, which also happens to be inside the Narain Niwas. When the former Tocca designer Marie-Anne Oudejans moved to into the ground floor apartment of the Jaipur hotel seven years ago, she had no idea that one day, she’d fall in love with interior design and decorating. After being approached to reimagine the hotel bar and restaurant, Marie-Ann thought it was time to give her own suite a makeover. Walls were repainted, chairs were reupholstered and furniture was custom built. It’s floor to ceiling breathtaking. The canopies! The painted ceilings! The colors! Glorious! !